Data from: Are the radiations of temperate lineages in tropical alpine ecosystems pre-adapted? The file contains (1) the sequence alignments (nc, cp, and full concatenated) and the resulting ML and MCC trees, (2) the spatial points from the New World with climate data, and (3) the species occurrence datasets with environmental variables (all sp occurrences, max 15 occ/sp, and the species specific climate values as median, 5-qtl, and 95-qtl). Aim: Tropical mountains around the world harbour an extraordinarily rich pool of plant species and are hotspots of biodiversity. Climatically, they can be zoned into montane climates at mid-altitudes and tropical alpine climates above the tree line. Around half of the tropical alpine species belong to plant lineages with a temperate ancestry, although these regions are often geographically distant. We test the hypothesis that these temperate lineages are pre-adapted to the tropical alpine climate. Location: New World, with a focus on tropical alpine Andes. Time period: Miocene to present. Major taxa studied: Flowering plants. Methods: We build multidimensional environmental models representing the full space of New World climates. We quantify the environmental similarity between the tropical alpine ecosystem and those of potential source areas, while correcting for regional differences by kernel density smoothers. Based on spatial observations of the genus Hypericum (St John's Wort), we quantify niche overlap and test for niche conservatism following intercontinental dispersal using density-weighted nonparametric tests. 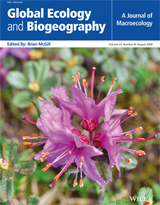 A dated species tree, biogeographical estimation, multi-optima Ornstein–Uhlenbeck models and model selection approaches are used to test for niche shifts during establishment in the tropical alpine Andes. Results: The tropical alpine ecosystem is isolated by its climate from adjacent regions and is climatically similar to temperate lowland biomes of both hemispheres. Niche conservatism is evident in the study group, except in the tropical alpine lineage that is characterized by niche expansion and shifts in temperature optima. Main conclusions: Our results reject the pre-adaptation hypothesis and instead suggest pronounced niche evolution during colonization of tropical alpine ecosystems. Establishment involved substantial niche shifts, mainly in temperature-related variables, and resulted in a tremendous proliferation of species in the newly invaded tropical alpine ecosystem.